As the oldest mint still in existence, the Royal Mint is packed with the kind of history that excites even the most discerning of numismatists. Not only has this mint served the British Isles for over 1,000 years but, throughout its history, it spawned many other famous mints. The Royal Mint was first established in the year 886, when Alfred the Great was in power. At the time, it was just one of many mints in England, but it moved to the Tower of London 400 years later. There it would remain for many years, developing a monopoly on coins in the country. A few hundred years after this, the Royal Mint had perhaps its most famous Warden when Sir Isaac Newton assumed the role, eventually becoming the Master of the Mint at a later point in time. Over the years this became the most respected position in the Mint and one of the most respected occupations in Great Britain. In the 19th Century, main headquarters relocated to East Smithfield, and a grandiose building was built to house the machinery. The former quarters at the Tower of London remained for another century or so. In the Second World War, the Germans Air Force bombed the Royal Mint, causing significant damage and putting it out of production for a few weeks. It moved again in the late 1960s, setting up shop in Llantrisant, Wales, where it remains to this day. There are over 900 people working for the Mint, which is owned by Her Majesty’s Treasury. 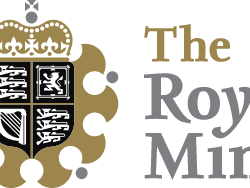 The main purpose of the Royal Mint is to mint coins for use in the United Kingdom, covering Wales, Scotland, Northern Ireland and England. However, these are not the only countries it serves, as the Royal Mint deals with more countries and creates more coins than any other mint. It used to mint coins for Australia and Canada — establishing branches in those countries that would later become the Royal Canadian Mint and the Perth Mint — and it continues to mint for many British colonies and other nations. Not limited to coins, it also produces bullion bars for investment purposes, coins for collectors (many of which are also classified as legal tender) and military medals. It is said that for every 100 coins produced in the world, 15 of them originate with the Royal Mint, and the further you go back in time, the greater this number. 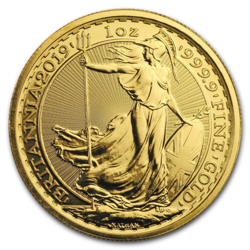 The main bullion coin produced by the British Royal Mint is the Silver Britannia, which is minted every year. This coin is often sold in gift packs and presentation boxes, with the price inflated by such additions. If you buy from a bullion dealer, you can likely get this coin for very close to spot price. The Royal Mint also sells proof editions and presentation sets of all their standard coins. 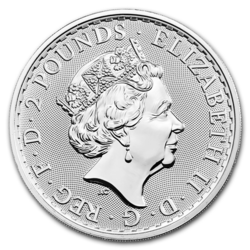 These are released every year and, in any given set, you will find a 1p, 2p, 5p, 10p, 20p, 50p and 1 pound sterling coin, all minted to high standard in pure silver. They also produce Gold Sovereigns and Half Sovereigns every year. These are struck in 22-Karat gold and, while they’re not particularly popular with rare coin collectors, they provide a great way to buy cheap and highly-recognizable gold bullion. Due to its extensive history, there are many priceless coins that have been minted by the Royal Mint, some of which are hundreds of years old. A coin minted in pure gold during the reign of Edward III in 1344 sold for nearly $7 million a few years ago. This coin is not only incredibly old, it is also incredibly rare, and there are said to be just three of them in existence. Many other gold and silver coins minted in antiquity have sold to collectors and museums for impressive prices over the years. A coin doesn’t have to be old to be rare. For instance, the Royal Mint produced a coin in 2009 to celebrate Kew Gardens. It carried a very low mintage and, soon after its release, it carried a value significantly greater than its face value of 50 pence (75 cents). Today it’s valued at up to £150 ($225). Prior to 1947, all currency coins from the Royal Mint contained at least 50% silver, as opposed to 0% today. If you go back a little further, content was closer to 100%.